Springhill Nursery specialize in Plants Online Sale. Check and Order Flowering Trees, hydrangea, Butterfly Bush, Shade Perennials, Spring Hill Plants, Honeysuckle, Flowering vines, Rhododendrons, Day Lilies. 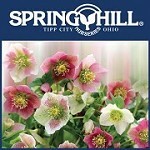 Springhill deals with all Order Plants Online sale, find your plants at Tipp City, OH. Impressive Deals from Spring Hill Nursery for your Incredible Garden! In 1849, while thousands sought their gold fortunes in California, Peter Bohlender started a small nursery in North Dayton, Ohio – Bohlenders Nursery. Peter had emigrated from Bavaria with his family at the age of 6. With few schools and no opportunity to attend, he went to work in a tobacco stripping house. Before he reached his teens he was employed by a nurseryman where he received his training for his life’s work. Peter Bohlender moved his nursery to Tipp City, Ohio in 1889, and during World War I he renamed the nursery Spring Hill Nurseries. He derived the name “Spring Hill” from the hill located across the creek from the present day location of the garden store’s growing area. Spring Hill Nurseries was originally a wholesale garden store nursery, owning nearly all the property surrounding its present location. Over the next 40 years, Spring Hill slowly began to move out of wholesale and into mail-order. Spring Hill shifted the majority of its focus to mail-order in 1930.